Paleo Sweet Potato Casserole – A Thanksgiving classic with a healthy twist without compromising on flavour! Easy to make with only nine ingredients needed! Possible controversial opinion here: I never liked traditional sweet potato casseroles growing up. The marshmallows threw me off and I’m still not even sure if it’s supposed to be a dessert that you just eat along with the meal or what. I also never used to like sweet potatoes but I think it’s clear I’ve gotten over that aversion pretty easily (as seen here, here, here….the list goes on). So naturally it felt right to give this classic another shot which landed me here with this paleo sweet potato casserole. It goes easy on the added sugar and the topping is just a simple, crunchy pecan streusel but these natural flavours really don’t need much needed to shine on their own. Once your potatoes have been peeled and diced – boil them for about 20 minutes until they are perfectly fork tender. Drain away the water and then mash it all up with your base ingredients. Use a fork, a potato masher or throw it all in a blender or food processor if you want. When you’re ready, spread the mash out in a large casserole dish and bake while you prep your topping. While your casserole is cooking take this time to prep your topping. Roughly chop up your pecans and throw them in a bowl along with a little maple syrup, cinnamon, salt, vanilla extract and coconut oil. Mix it all up to coat in oil and syrup and set aside until you’re ready to top. You don’t want to bake your topping too soon because the pecans will burn quicker than the rest will cook. When you’re about halfway through the casserole bake, take it out of the oven and top with your cinnamon-maple-pecan topping. Pop it back in the oven and bake another 20 or so minutes until the top is toasty and done & that’s it! 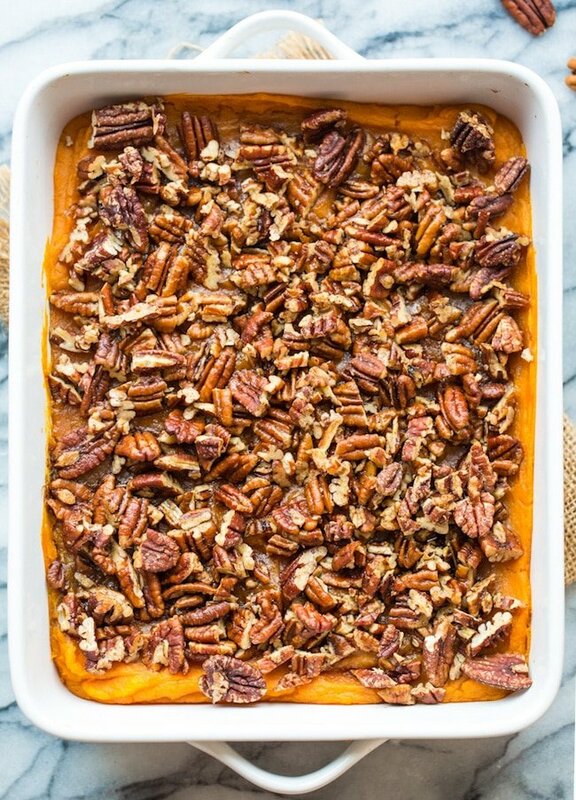 Sweet, crunchy, custard-y paleo sweet potato casserole that’s easy on the sugar and minimal on the ingredients. 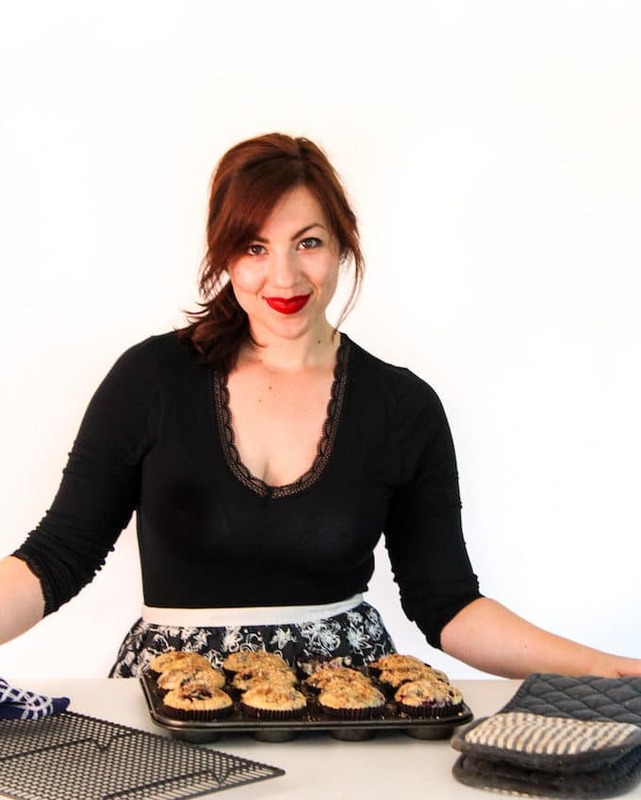 Team sweet potato casserole – yay or nay? 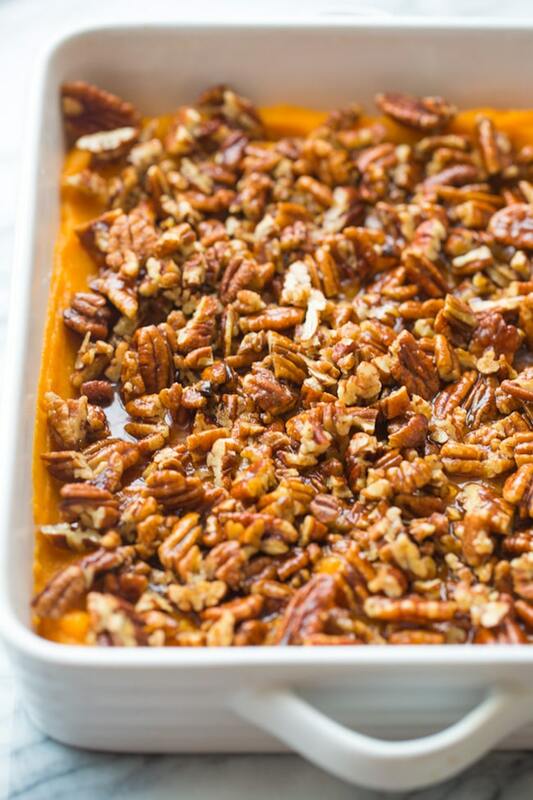 Don’t forget to #asaucykitchen on instagram if you this Paleo Vegan Sweet Potato Casserole! I love seeing what you make! You can also post your pictures to my facebook page! Paleo Sweet Potato Casserole - A Thanksgiving classic with a healthy twist without compromising on flavour! Place the diced sweet potato in a large pot and cover with water. Bring to a boil then reduce down to a simmer for about 20 minutes or until the sweet potato is soft, completely tender and easy to mash. Preheat the oven to 375°F and grease a 9x13 inch or 2.5 quart (10 cup) baking dish. 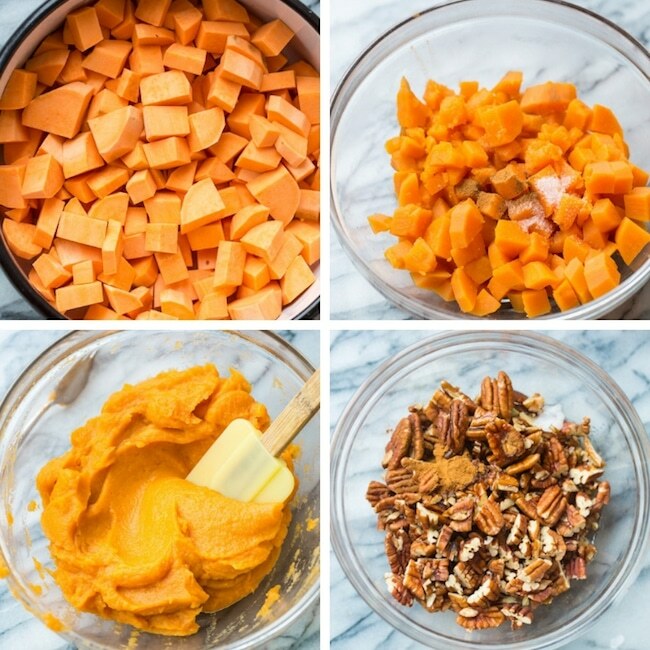 Drain the water from the sweet potatoes and add to a large mixing bowl along with the maple syrup, milk, coconut oil, eggs, cinnamon and salt. Mash with a fork or potato masher until mostly smooth. Taste and season with a little more salt, cinnamon or maple as you see fit. Transfer the mashed potato mixture to the prepared baking dish and smooth over in an evenly layer. Place in the oven and bake for about 20 minutes. In a smaller mixing bowl mix together the topping ingredients until combined. 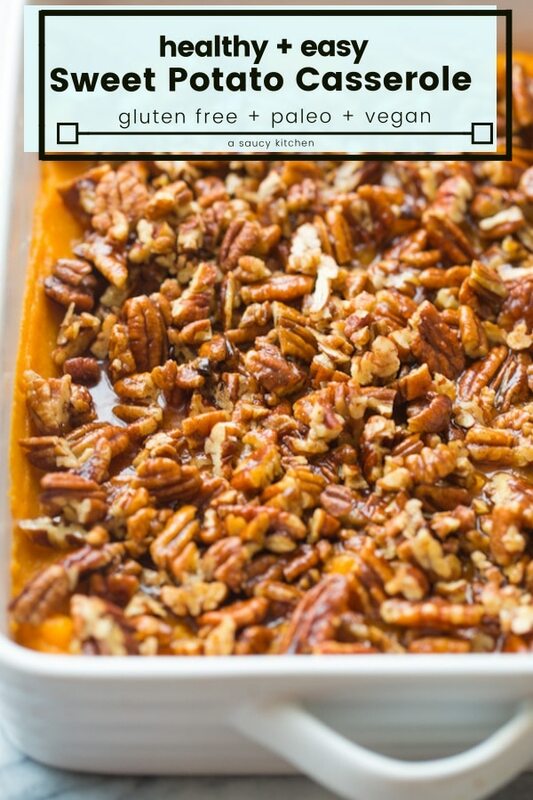 After the casserole has baked for about 20 minutes, remove from the oven and sprinkle the pecan mixture over the top of the sweet potatoes evenly. Return to oven and bake another 20 minutes until the nuts are toasted and goldened. You can use an egg replacer like Bob's Red Mill or Ener-G (<-- affiliate links)for the most similar outcome. Traditional sweet potato casseroles uses eggs for a more custard-like result but you can absolutely just omit the eggs from this dish. It will be more like a typical mash with the binding of the eggs but it still is delicious! If you do make this completely egg free you can reduce the cook time to 20-25 minutes. Keep in mind that by using an egg replacer like the ones listed above this will no longer be paleo. This was an absolute hit on the Thanksgiving table tonight! Yay! I’m so glad you guys liked it! Thanks so much for coming back to let me know what you thought!